Persimmons are a fruit I have rarely eaten, but every time I do, I realize how much I love them and how amazing this world is to have such myriad fruits to explore from season to season! Persimmons grow in China, Japan, Taiwan, and even here in the United States – there’s a species that even grows in the US, called the American Persimmon in the Midwest and East primarily. It is such a special and rare species, that the American Persimmon is even on the Slow Food Ark of Taste! Today, I was inspired to create a tart that features the persimmon, and was able to find some beautiful hachiya and fuyu persimmons locally here at Healthy Living Market in South Burlington! This tart will be perfect for any fall potlucks or even your Thanksgiving table this year – Enjoy! Turn oven on to 350°; arrange 1 rack set in the center and a second rack set on the rung closest to the broiler. In a food processor, pulse flour, 3 tablespoons sugar, 1½ tablespoons ginger, and the butter until fine crumbs form. Add egg yolk and whirl until dough comes together. Add ice cold water by the tablespoon if needed to bring the crust together. Press over the bottom and ½ inch up the sides of a 4- by 14-inch tart pan with a removable rim (or use a 9-inch round tart pan). Combine remaining 6 tablespoons sugar, remaining 1 tablespoon ginger, the cinnamon, lemon juice and brandy in a bowl. 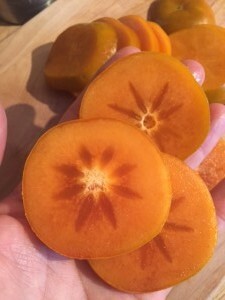 Remove calyx from persimmons, slice fruit into 1/3-inch thick slices, and stir into brandied sugar. Arrange fruit in 2 overlapping rows in crust (or in circles if using a round pan). Spoon 2 tablespoons of the sugar mixture from bowl over fruit. Bake tart on center rack until crust is deep golden, 25-30 minutes. Cover loosely with foil and bake until persimmons are tender when pierced, 15 minutes more. Remove tart from oven and preheat broiler. Set tart on a baking sheet. Cover pastry edges with strips of foil. Broil on rack close to heat until edges of fruit brown, 1-2 minutes. Let cool at least 30 minutes. Alternatively, if you have a bruleé torch, sprinkle a little more sugar on top and lightly carmelize the sugar to keep from burning the crust. Loosen crust from rim with a small knife, then remove rim. Slice and serve.